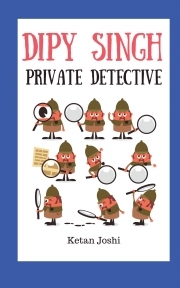 Description of "Dipy Singh - Private Detective"
Move over, Sherlock - there's a new detective on the block! Dipy Singh handles cases which other detectives cannot - Vampires, sorcerers, godmen, disappearing thieves... nothing fazes him - and chills out with some delicious tandoori chicken and cold beer. Intriguing, funny and unique - these stories are a uniquely Indian take on the detective genre - and much like the tandoori chicken, these are tasty, spicy and different from anything else you would have had before. So dig in into these toothsome tales - The game is afoot! Ketan Joshi writes fiction, non-fiction, and travelogues. Reviews of "Dipy Singh - Private Detective"